The book was recognized by the Collective Behavior and Social Movements Section of the American Sociological Association with the 2017 Charles Tilly Distinguished Contribution to Scholarship Book Award. "Too often, in the study of contention, the material and the cultural have been seen as incompatible forms of explanation. In this empirically rich, theoretically important book, Simmons shows how the material and ideational were fused to catalyze popular protests over water in Cochabamba and rising corn prices in Mexico. In doing so, she has made it much harder for scholars of contention to ignore the causal force of grievances or to depict material threats in strictly economic terms." "In Meaningful Resistance, Erica Simmons shows how cultural and symbolic meanings related to subsistence goods shape patterns of social resistance to market liberalization. Drawing from rich ethnographic research on social protests around water privatization in Bolivia and corn prices in Mexico, Simmons skilfully weaves together material grievances and cultural meanings to explain the origins and dynamics of protest mobilization. This book breaks new ground in its theoretical integration of cultural and structural approaches to the study of social movements, and it is essential reading for anyone who wants to understand how material grievances become politicized. This is an important book that deserves to be widely read." Not since Karl Polanyi and E. P. Thompson has a scholar so convincingly shown the connection between material life and popular politics. Simmons’ examination of protests against neo-liberal attempts to privatize and utterly commodify water and maize is astute, subtle, and carefully reasoned. A model of theoretically informed comparative analysis. Bottom photos from top. 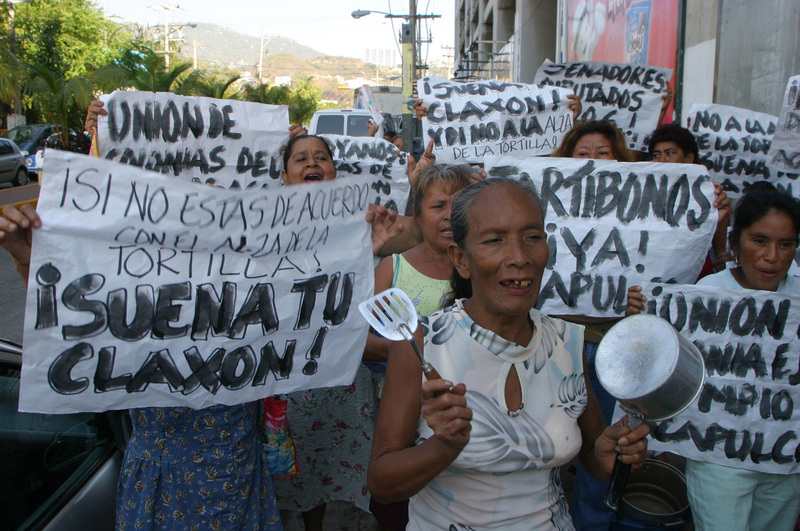 Protesters in Acapulco, Mexico, 2007. Courtesy of La Jornada. Protesters in Mexico City, Mexico. From lizdovella, Flickr.